My thanks to Tim Hanlon for having me as a guest on his excellent “Good Seats Still Available” podcast. Not only did Tim give me plenty of time to talk, he did his homework on the topic, asked good questions, and is promoting the heck out of it. Beyond all that, the idea of there being a podcast devoted to sports teams and leagues that no longer exist is a very cool idea, and I’m glad I found it. You might call Dan Casey one of baseball’s original crafty lefties. The pitcher, then just 21 years old, went 11-3 for the 1884 Quicksteps, including starting and winning the club’s first-ever Major League game, a 4-3 victory over the Washington Nationals. Casey came to Wilmington direct from his family’s farm in Binghamton, N.Y., accompanied by his brother Dennis Casey. Dennis, an outfielder for the Quicksteps, was five years older than Dan and had had several years of pro experience. 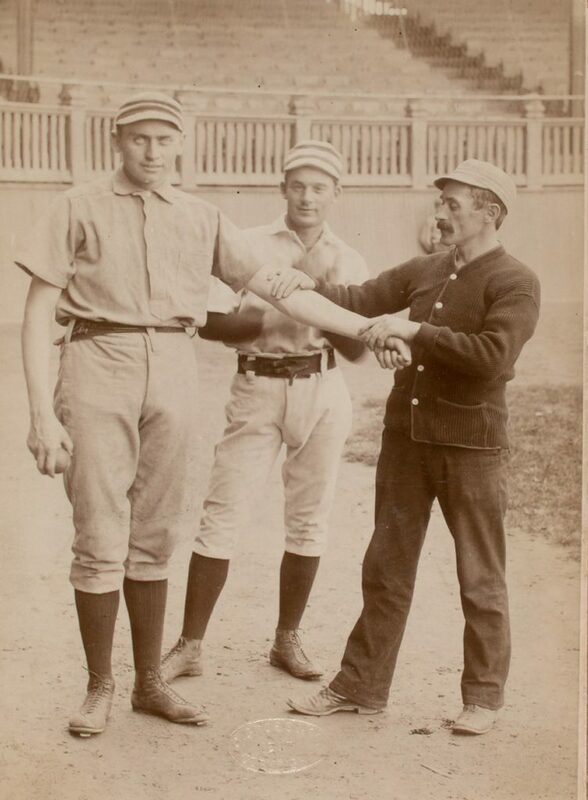 Casey was a big man for his era, listed at 6 feet tall and 180 pounds. While that make him seem slight compared with pitchers of today, he towered over many of his contemporaries in the 1880s, as shown in this photo from 1887. That’s Casey getting his valuable left arm rubbed down by a trainer for the Philadelphia Quakers (nee Phillies). Behind him is Charlie Bastian, the 5-foot-6 infielder who was Casey’s teammate both with the ’84 Quicksteps and the ’87 Quakers. Casey’s stint with Wilmington ended as abruptly as it started. The very same day he beat Washington in the club’s big-league debut, Dan’s brother Dennis and their teammate and captain Oyster Burns jumped the club for a better offer with the Baltimore Orioles, depriving the Wilmington club of its two best hitters. While teammates grudgingly understood that Burns deserved the opportunity they were resentful of Dennis’s departure, making for an especially uncomfortable situation for Dan. And after Dan mailed in his next effort, surrendering 14 runs on 14 hits to the same Washington club, he was swiftly and unceremoniously released. Casey worked his way back to the majors the next season, advancing from the independent Indianapolis Hoosiers to the Detroit Wolverines of the NL, then spent the next five years in Philly highlighted by a 28-13 campiagn in 1887, when he led the National League with a 2.86 ERA. Casey was said to specialize in throwing a screwball, which may have been taught to him by his 1884 Wilmington teammate, Edward “The Only” Nolan. His big-league career lasted through 1890 but records show he spent several more seasons in the minors, most with his hometown Binghamton Bingos. Casey’s deceptive delivery however continued long after his baseball career was over. 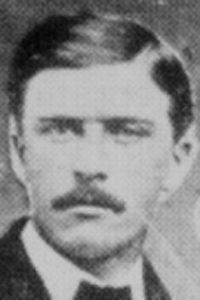 Working as a trolley conductor in Binghamton, Casey began telling friends that he was the inspiration for the tragic hero of Ernest L. Thayer’s famous baseball poem, “Casey at the Bat,” which was first published in 1887. In the poem, the “Mudville Nine” trail 4-2 in the ninth with two outs before “Flynn” singles and “Blake” doubles to bring the tying runs to second and third before Casey disappoints them all by striking out. Casey insisted the poem was based on a game between Philadelphia and the New York Giants in 1887 and in his version, Flynn is Charlie Bastian and Blake is teammate Joe Mulvey. Historians have little trouble shooting Casey’s story down. The details don’t exactly line up (the game ended in a tie, Bastian didn’t play that day and Casey didn’t actually strike out but drove in the game-tying run off Tim Keefe of the Mets) and it’s very unlikely that Thayer, then living in San Francisco, would retain the details of that game. The poet himself said characters were a composite. But in 1939, as baseball was celebrating another bogus legend — the 100th anniversary of its alleged founding by Abner Doubleday and the dedication of its Hall of Fame Museum where his invention supposedly had taken place, Cooperstown, N.Y. — Commissioner Ford Frick invited the 76-year-old Dan Casey along and had him recreate the event that inspired the famous poem with Rogers Hornsby pitching. Casey was then presented with a lifetime pass allowing him to attend any baseball game. When Dan Casey died in 1943, at age 80, the myth persisted. I’ve done a little publicity for the book but nothing as terrific as the interview with Marty Lurie of KNBR during the San Francisco Giants pregame radio broadcast the other night. Marty is something of the Howie Rose of Bay Area baseball radio, and I appreciate the genuine interest he took in the subject matter, which made a huge difference in my enthusiasm. Thanks to Bob Rose for the assist. Give it a listen! Somewhere in here lie the remains of Joe Simmons. 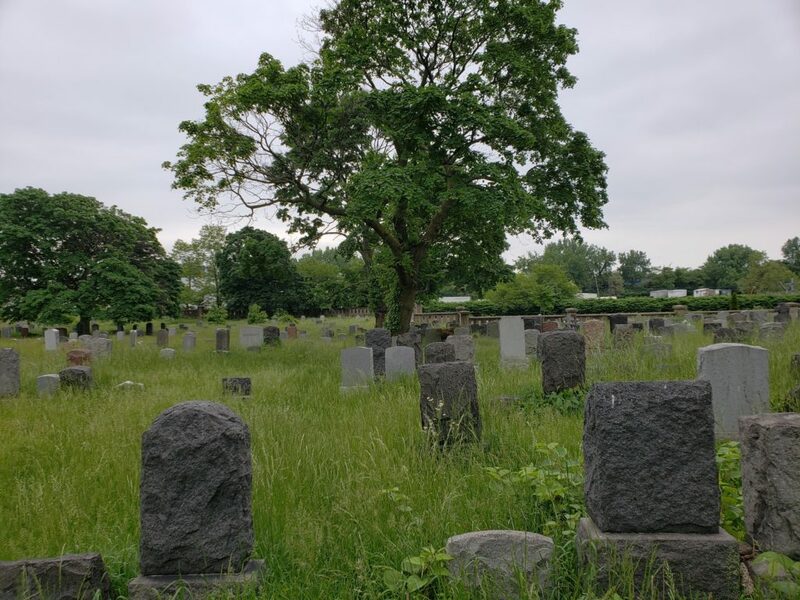 With the help of a ferry ride, I biked out to Jersey City recently to try and find him but the Bayview-New York Bay Cemetery is pretty big, there was no one on duty the day I got out there to access any records, and hundreds of tombstones were more or less inaccessible unless I’d risk tick bites in the high grass. I’m not even sure Joe has a marked tombstone but I spent an hour of so wandering through looking anyway. No dice. That Joe Simmons is overlooked in death is a kind of ironic match for how overlooked he was in life, and also, how he looked after those who themselves might be overlooked. Of the characters making up the 1884 Quicksteps, manager Simmons, sometimes called “Ice Water” or more commonly, “Old Joe,” was hugely influential in assembling the club that dominated the Eastern League in 1884 and eventually became the only “major league” club in Delaware history. In the days when you couldn’t access a player’s statistics on your phone, or even consult a scouting bureau for a report, there was no substitute for the experience of a well-traveled baseball man. The game at that time was a speculative venture on many fronts. Among the second-tier players available to minor league clubs, there was no shortage of guys who could fake a resume or exaggerate their accomplishments in some other city in order to land a job. For many, it was preferable to the only alternative, likely a low-paying factory job or hard manual labor. But Joe Simmons knew a ballplayer when he saw one. Born Joseph S. Chabriel to French immigrants in New York in 1844 or 1845 (records vary) Simmons — he used the American-ized non de plume as a ballplayer, likely a version of a middle name Simon) came of age at the right time for a baseball pioneer. His experience dated to his childhood around New York where he came up as a cricketer then took up baseball with storied clubs like the New York Gothams (1865), New York Empires (1866-67), and Unions of Morrisania (1868). In 1869, Simmons headed west and played two seasons with the Rockford, Illinois Forest Citys, where his teammates and contemporaries included future Hall of Famers George Wright and Albert Spalding. When baseball went professional Simmons was the center fielder for the Chicago White Stockings of 1871 — a team whose pennant hope died when their stadium burned to the ground in the Great Chicago Fire. Simmons also worked as an American Association umpire and manager with a variety of pro clubs including the Rochester Hop Bitters, whom he led on an 1879 tour that reached San Francisco — an extraordinary long journey back then. By the time he was engaged to manage the Quicksteps at age 38, Simmons had been through enough hot summers on the baseball field to know his team needed to be in great shape physically: He had his club work out in gyms and led them on long walks. Beyond that, Simmons developed a reputation as the kind of manager willing to take on players who might be considered discipline problems by his counterparts. For Wilmington, he engaged two such men — the fiery and violent tempered slugger Oyster Burns, and most famously, the notorious carousing pitcher, Edward “The Only” Nolan. The veteran Simmons and the wild rookie Nolan had been teammates on the 1876 Columbus Buckeyes, but by 1884, Nolan’s history of discipline issues, egomanical behavior and suspensions had rendered him virtually employable by pro clubs. Deftly handled by Simmons, who allowed the pitcher to retain his regal bearing as long as his pitching held up, Nolan had a resurgent campaign many felt was beyond him. As to Burns, Simmons presciently installed him as team captain, though he was only 19 years old. Of the 1884 club, Burns would the longest and most productive pro career, emerging as one of the earliest power hitters of the Dead Ball Era. Simmons remained a champion of those left behind by a myopic baseball world including employing black players with his minor league clubs after racist leanings drummed them out of the pro game just as it was getting started. Fleet Walker, a catcher on the 1884 Toledo Blue Stockings of the American Association, was the majors’ last black ballplayer until Jackie Robinson came along, but he found work with Simmons’ 1886 club in Waterbury, Connecticut. In 1887, managing in Syracuse, Simmons engaged a young black lefty named Robert Higgins, whom he continued to put on the mound even after teammates sabotaged his performances and refused to sit for a team portrait with him. In 1891, Walker wandered into a white Syracuse neighborhood, encountered some local toughs who demanded what was he was doing there, and in an ensuing scuffle fatally stabbed one of his attackers. (Walker was charged with second degree murder but eventually found not guilty). Walker was there, he said, to visit his friend Joe Simmons. Simmons supported himself in offseasons variously as a cook, a furntiure polisher and a carriage driver. A second stint as an umpire reportedly ended in 1889 when he struck in the eye by a ball, permanently compromising his vision. Simmons died at his home in Jersey City in 1901 at age 56. He’s still around somewhere. 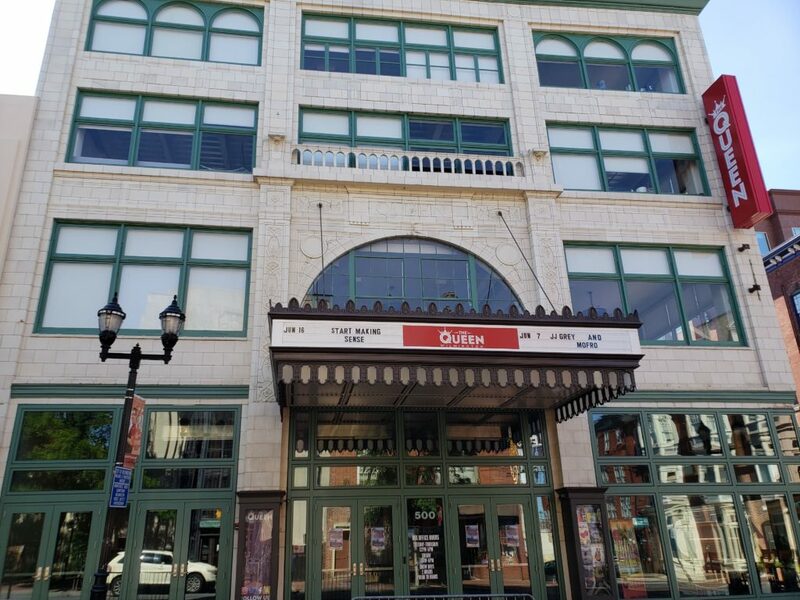 Here’s the Queen Theater at 5th and Market streets in downtown Wilmington, which for more than 200 years has been — off and on — a central gathering place in Wilmington. Said to have been built shortly after Thomas Willing laid out the city in 1732, it was address of a pub known as Welsh’s Tavern, and by the 1790s the Queen of Otaheite, said to have been named in honor of a local whaling crew that touched down in Otaheite or what today is known as Tahiti. Likely for reasons of pronunciation, it became popularly known as the Indian Queen, and its guests included future president Martin Van Buren. Writing in the Wilmington Morning News, columnist W. Emerson Wilson relayed that it was expanded to three stories by proprietor John Hall in 1846 and for a time was occupied by high-ranking officers fighting the Civil War. In 1863, confederate leiutenant Samuel Boyer Davis was said to have breakfasted there after escaping from a hospital in Chester, overhearing Union soldiers seated at an adjoining table plotting his recapture. Artisans Bank and First National Bank of Wilmington in the 1870s acquired the property with intentions of turning it into corporate headquarters but with the industrial revolution bringing rapid growth to the city, decided instead to renovate and reopen as a luxury hotel. Adding two stories to the building, the Clayton (named in honor of the noted Delaware statesman John M. Clayton, a former U.S. Senator and Secretary of State under fellow Whig Zachary Taylor), opened in 1873 and was designed to rival the finest locations in bigger cities. In 1884, the Clayton was the address of choice for many of the Quicksteps players, and for the visiting baseball clubs passing through town. On September 4, Quicksteps outfielder John Cullen stumbled into an empty elevator shaft in the lobby and fell a dozen feet into a basement well of filth sustaining serious back injuries that ended his season. Cullen said later that a light alongside the elevator was out at the time he approached the door and so never realized the elevator car was on an upper floor. Given the time of his arrival, shortly before midnight, his company, Jimmy Say, and Cullen’s own history with alcohol, it’s quite likely he was drunk. The Clayton hosted guests through 1915, but by then its status as Wilmington’s finest hotel had been surpassed by the Hotel duPont a few blocks north. The building the following year reopened as the Queen Theater, a 2,000-seat movie theater. That iteration lasted until 1959. The building sat unused for about 50 years before a renovation begun in 2009 led to the present Queen, a live music venue. Builders at work on that project uncovered murals, textures and an old organ some dating to the Clayton’s glory days. Hey Wilmington! Please join me Saturday, June 16, at 11 a.m. at the Barnes & Noble store next to the Concord Mall, where I will be holding a discussion of ONCE UPON A TEAM, give a short reading and will sign as many books as I possibly can. I just devoured FASTBALL JOHN, a revealing and funny autobio of the 1970s-era pitcher John D’Aquisto, and so I’m excited to meet Dave at this event and perhaps get his signature on my Kindle. I’ve known Greg forever; his writing about the experience of being a Met fan is the best there ever was, and his feel for Mets history is remarkable, his books are great. Somehow we’ll all find a way to discuss our recent work and eat plenty of pizza, while also paying tribute to the late Rusty Staub, a famous New Yorker and famous eater. 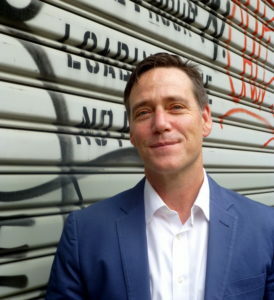 This is all tied together through Two Boots founder and owner Phil Hartman, who was gracious enough to have hosted a series of similar events at his restaurants a decade ago when Greg was promoting his FAITH AND FEAR book and me the METS BY THE NUMBERS. These hangouts were great fun; I hope you can join us there. Thursday, June 28, 7 p.m.; Two Boots Pizza: 337 Lexington Ave. (at 39th Street). Hello! I’m the author of ONCE UPON A TEAM: The Epic Rise and Historic Fall of Baseball’s Wilmington Quicksteps, which officially hit bookstores this week and is also available in various electronic editions. I’m going to use this space to talk about the book and the stories in it, highlight any promotional efforts, answer questions, etc etc. ONCE UPON A TEAM is my second book though the first I’ve written all by myself. My friend Matthew Silverman contributed to METS BY THE NUMBERS, which published in 2008 and again in 2016. In real life I’m a journalist who writes about the food business, though I am a former daily newspaper sports writer. The book tells the story of a dominant minor-league baseball team that in the midst of a tumultuous year for the development of the professional game were abruptly promoted to the major leagues and left behind a virtually unassailable record for futility. No team in the annals of what we consider “Major League Baseball” ever posted a worse winning percentage than the Quicksteps’ .111 in 1884. There are plenty of caveats to that, which I get into in the book. Historians debate for example, whether the Union Association should be even considered a Major League at all. And there’s no doubt the Quicksteps were actually a much better team than what their record ultimately said they were. The book grew out of an article I wrote 15 years ago for a Wilmington variety magazine called Out & About. I grew up and reside in New York, but I attended college at the University of Delaware and worked and resided in downtown Wilmington for four years. In all my years living there I never realized that pro ballplayers walked the streets 100 years before I did, and that they were participants in such an extraordinarily unusual episode in baseball history. If you’d like an autographed copy, or have questions or feedback, please let me know and I hope you enjoy the book!